I’m excited to share a project I worked on with one of my great clients Harrods. The team recently launched the Sweet Street area on the fourth floor of their inimitable Knightsbridge store, and wanted to make the entrance from one side have impact. I was asked to create a piece of wall art for this; which would give a good teaser to the sweet shop space, but also be tasteful and in keeping with the wider store area. The project was a new challenge for me; when you get used to being commissioned for similar types of project, you can run the risk of getting too comfortable with the relatively small remit of work that you do. With this in mid it was so nice to be trusted by Harrods for the project. It also felt good to push myself out of my self imposed comfort zone and do something that felt at times scary and daunting, but also great, to rely on and be confident in my own ability. For the design I wanted to create something quite free and playful; picking up the existing colours in the pop up, and incorporating a sense of movement. The process from my initial drawings to installing the illustration into the space was pretty quick, and it was a cool learning experience to see the attention to detail and work that goes into a massive store like Harrods, to keep it looking beautiful and to such a high standard all the time. Excuse my night time iphone photographs! The wall art is in Harrods now, so go and treat yourself to a colourful sweet treat and have a look. I never really planned it this way, but a good proportion of the work I do as an illustrator consists of commissioned portrait work. I kind of fell into doing this; I always did it for my own friends and was used to doing similar stuff commercially but when my friend Sophie asked me to do a little drawing of her and her mum for her birthday present, I said I couldn’t do that and it wouldn’t look right. She characteristically insisted (I love that about her) and her mum loved the drawing. From doing this little piece as a favour, (I think she paid me in a delicious lunch made by her at the design studio we worked at together at the time) I got asked to do another and then another. Through good old word of mouth; the main medium that I’d never underestimate, and some sharing online I now do hand painted pencil and watercolour portraits and send them to a range of different types of people all over the world. I have painted families, groups of friends, lovers, brides and grooms, grooms and grooms, brides and brides! beloved pets, people that have passed, people right at the start of their lives and people towards the end. In short with my pencil I’m lucky enough to be asked to capture something special and meaningful for such a wide range of people. When someone comes to me wanting to trust me with an image that’s special to them and having me paint from it it’s so great, as it’s never going to be the same experience twice. I learnt quite early on the kinds of images that work well with my style, movement, laughter and candid shots work best, and I’ve been sent grainy camera phone images right along to studio professional posed photographs, and made them work. One type of image I really fall for when commissioned by someone is a vintage printed photograph. 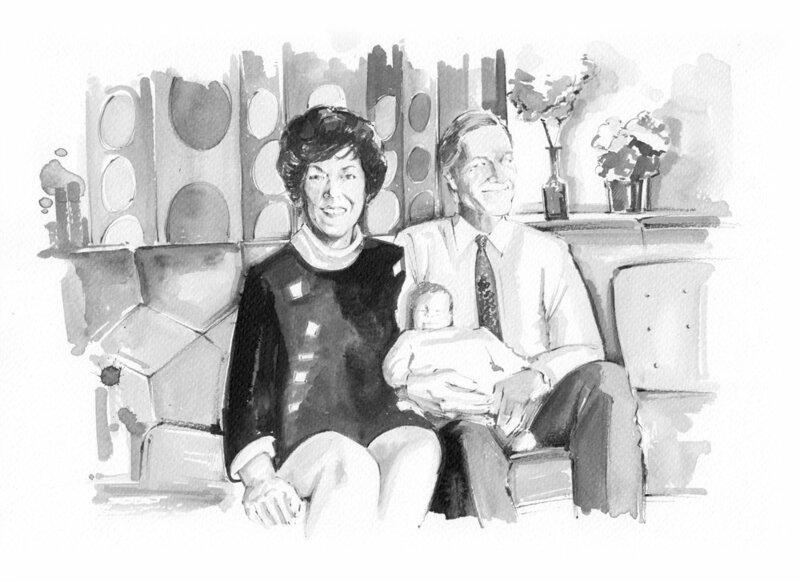 This week I just completed a drawing from a regular commissioned client, who sent me a photograph of his parents from their wedding, 40 years ago. There’s something so beautiful about these types of images, from the 70’s and 80’s which I just love so much. I think working from a printed and scanned photograph already gives the image a painterly feeling, which works so well when worked on in paint. Perhaps my love for these types of image is a reaction to the flood of images I see on a daily basis as an instagram…and general internet user. The beauty of these images isn’t supposed to be in highly edited perfection, but in capturing a moment, and as time goes by and fashions and aesthetics change, I as the viewer can appreciate this little capsule even more. I’m in one of those age brackets who even in my thirty years has seen the way we take photographs change almost year on year. From my dad’s beautiful Canon film camera which he carried around for much of my childhood documenting sunny days in the garden, my family’s swathes of clashing 80’s print and ice creams dripping down mine and my brothers little chins, to my teenage use of disposable cameras; posing withfriends with Spice Girls inspired not-yet-self conscious sass. Through to university days of bringing a cheap digital camera out with me to parties; sending it on a pass the parcel around the room and finally collecting it at the end of the night and posting the results to an unedited album on facebook, for everyone to greedily devour along with their hangover breakfasts the next day. Now to modern day with instagram posts, constant documentation and sometimes false realities, it’s definitely a strange metamorphosis. Perhaps it’s seeing this change that gives me this love for the older, an aesthetic not yet tinged with the need for likes. I’ve shared some of my favourite vintage image work that I’ve done over the last couple of years or so. There’s something about these images which range from a Wedding in 1970’s Texas, to a very cool 1980’s dad and a family portrait where you can almost feel like you’re in an living room that sits somewhere between Abigail’s party and Mad Men. Perhaps it’s the domesticity combined with the element of the ‘special occasion’ of these images that draws me to them so much. I love that now we can take ten pictures next to a far flung waterfall on holiday and not think anything of it or document what’s happening every day if we want to, and find some beauty to that, but I think I’ll also always love the singularity of the vintage photograph. To bring me back to that feeling I have when I’m painting; of capturing a moment that’s special. A couple of weeks ago I painted this card for my Grandma on her 90th Birthday. Featuring all her loves and interests. nyongalice@googlemail.com if you'd like to discuss me making something similar! nyongalice@googlemail.com to discuss your idea. I have launched my Christmas cards! It feels like a long while away, and until this week I was clinging to sandals with the best of them, but if you're sending them far away it's great to prep. They are at my usual market price of £2.50 each and 5 for £10 everywhere! Just because I'm feeling festive. They're all printed from my original drawings and paintings, and A6...They will probably be a limited edition, and are available on Etsy or at My christmas markets this year. I will be at Etsy Made Local in Crouch End Saturday the 3rd of December, and Urban Makers East on Sunday 11th December. I was commissioned to paint this lovely smiley family a couple of weeks ago. What a nice job. alice@alicenyong.com to discuss commission ideas. Above is a card for my friend Jessica Skye, one of my favourite yogis, DJ and all round super woman. Below is a card I was commissioned to make for a birthday. Love the animated faces. I feel very lucky to be asked to capture such nice moments by people who commission me, and this one was no exception. Here I painted Jaz and her dad in a sweet selfie for his birthday present. I love it, and is also great to see it in situ. For commission enquiries email alice@alicenyong.com to discuss your idea. I had the pleasure of taking part in the Crafty Fox Market on Sunday, which is always a super fun day. I was selling my cards, original artworks, and some new NOTEBOOKS, which I'm excited about. It's actually great to debut new products to a market audience, and I think they went down really well. Fun all round. Look out for the books on my Etsy soon. The next market I'm taking part in is Urban Makers East, on April 23rd at Mile End Ecology Pavilion 11 – 5pm. Come and say hi if you're around! I painted this card for my mum this mother's day. It features me, my bother, mum and grandma so it's quite special. I also noticed this tweet from the ever awesome JK Rowling, which I felt summed up the day really nicely. "A little back ground if you want, this was a picture was taken of granny about a year after she fell down some stairs and sustained a huge brain injury that basically changed her life. When she was able to leave the hospital she never returned home and went straight into a care facility where she spent a few months before she passed on the 12th September. This picture was taken about 1month before she died, She was allowed back to our house on a day visit and we sat in the garden and I painted her nails and ate croissants!" I really love my job sometimes! Thank you Hollie. alice@alicenyong.com for commission enquiries. Really fun poster design for the eponymous night Last night a DJ spilt my pint Come down if you're near Hackney! I captured mine and my friend Hannah's joint love of the drink of queens; the espresso martini for her 28th Birthday card this year. Happy Saturday, and enjoy one of these dark and lovely concoctions if you get the chance. I’m really excited to announce that I will be leading a new evening drawing workshop popping up in different fun venues across London. The workshop is called ‘The Mark Makers’ and will be ran by myself and Becky Noy. The aim is to make the workshop fun, and non-stuffy, and a fun opportunity to spend the evening drawing and learning, using still life. We want to give a new way of interpreting the traditional medium of still life, that you perhaps were forced to do at school, but incorporating exciting props, and fun exercises to help develop drawing skills. The ticket for the event will include a glass of booze, and a mini curated kit of materials to take away to get you drawing at home. Becky, who has a background in making and sourcing props will spend time building an exciting modern still life which serves as a unique focal point as well as a drawing focus. While I will guide you through the workshop and the steps needed to work on and develop drawing skills and create your own work. You will hopefully have a super fun evening, and leave with some great original artwork to take away, as well as a kit of materials and illustrated tips sheets for drawing at home and a thirst to learn more. The classes are great for all skill sets, whether you’re a master mark maker or a total beginner. We’re really excited about the project and it would mean a lot if you wanted to be involved! Thanks in advance! I had the pleasure of being commissioned to paint this wonderful birthday card a few weeks ago. alice@alicenyong.com for commission enquiries! Although I don't particularly go in for red roses, public meals or displays of affection surrounded by balloons and expectation on the 14th of February, I do like making cards. And this year I got to make a few, to serve the lovely fing of showing love. As well as my babe card which you can still buy on my etsy shop, I was also commissioned to make these little elephants for a really sweet valentines day card. For my own offering, I depicted an anteater cuddling someone's leg; a sight my valentine and I saw earlier this year at London zoo. There's no love like an anteater and his leg. I hope your day (and all your days) was full of love. Really love doing commissions for one friend to another, and this was super special as the original photo I had to work from was just so fun. I used watercolour paints and pencil. alice@alicenyong.com for your commission ideas! I have two new editions to my card collection. Just in time for Valentines Day, and Mother's Day. As well as general springtime...and let's face it all occassions. The 'Babe' and 'Daffodil' are available HERE NOW.